Competition is intense in the online casino industry, with hundreds of sites now in existence and vying for the attention of players. In breaking through the chorus of the industry, the leading online casinos depend on slot games to entice players and ensure they return. That’s where casino software developers come into the player engagement strategy. For every giant software developer like Playtech, NetEnt, and Bally Technologies, to name but a few, there’s a multitude of others operating at a smaller level. Consequently, there’s a clear need to be the best, or else another developer will seize your market share and excise you from the industry. Inevitably, the level of resources and standard of talent will differ from developer to developer, but the overarching determinant in creating successful slot games is the ability to understand player psychology, and then subsequently build connections with them. Forming a bond with players is a vital goal of developing any slot game. Designers working with the most successful software developers in the industry share that sentiment, as you will soon discover. Crucially, the need to focus on developing slot games is now greater than ever for casino software developers targeting the UK market. Statistical results obtained from the UK Gambling Commission clearly show that residents of the UK now wager more money playing slot games than they do on table games. In producing this specialist piece, a slot game designer working for a leading igaming developer provided expert insights. Their professional perspective validates the statistics and analysis presented throughout. 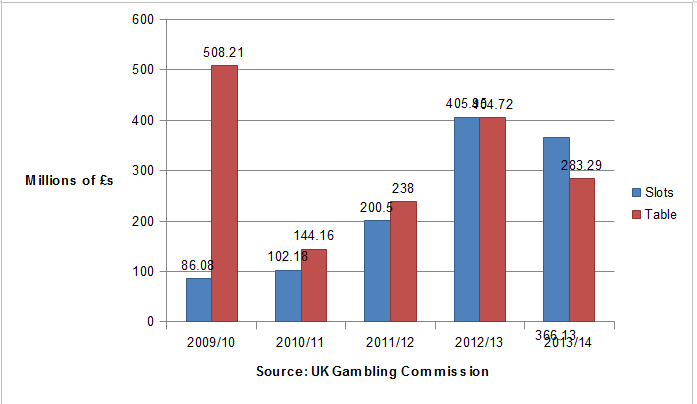 Since the financial year 2009/10, the Gambling Commission has meticulously tracked the wagering habits and preferences of all bets placed by UK-based gamblers with online casinos. Over the past five years, the popularity of slot games has dramatically increased in popularity, rising from revenue of £86.08 million in 2009/10 to £366.13 million in 2013/14. The full revenue breakdown of the five-year period has been displayed in the figure below. Based on the table above, it is evident that 2011/12 marked a major step forward for online slot games, as revenue almost doubled in size by 96%. Just a year later, the revenue more than doubled to a staggering £405.95 million. Two years of colossal growth signified that UK online casino players were becoming more interested in slot games. Meanwhile, the 9.8% decrease could be due to the market evening out. Technology is likely the fundamental factor that encouraged the dramatic upsurge in the popularity of online slots. Firstly, the improving internet connections made it possible for software developers to create more complex games that displayed superior graphics and featured quicker processing speeds for desktop players who used their PC or laptop. And the second technological factor that could have inspired the sudden growth of revenue in 2011/12 is mobile casino gaming. In addition to improving broadband, telecoms providers also sought to improve 3G connectivity and install Wi-Fi points in public locations throughout the UK. Simultaneously, mobile phones were beginning to evolve into the smartphones we know them as today. Apple iOS and Android were rapidly becoming the common operating system for mobile phones. By January 2012, the two systems accounted for 49.1% of all UK smartphones. Playtech, Microgaming, and NetEnt were leading slot developers that recognised the improving digital infrastructure at their disposal, which they could use as a delivery medium for their digital content. As software leaders of the industry, they had the resources to invest in the rapid deployment of their operator’s casino apps made available in the App Store and Google Play. As a result, online slot players were able to access their favourite games in two ways when before it had just been one. In considering the rising revenue of slots, perspective is also required. Therefore, it is important to compare the annual revenue of slot games with the contribution of table games. From the figure above, it can be determined that slot games are no longer a secondary option at casino sites, like they were in 2009/10, when the revenue of table games was worth £508.21 million compared to just £86.08 million for slots. However, table games came crashing down when the global economic downturn of 2010 began to take hold. 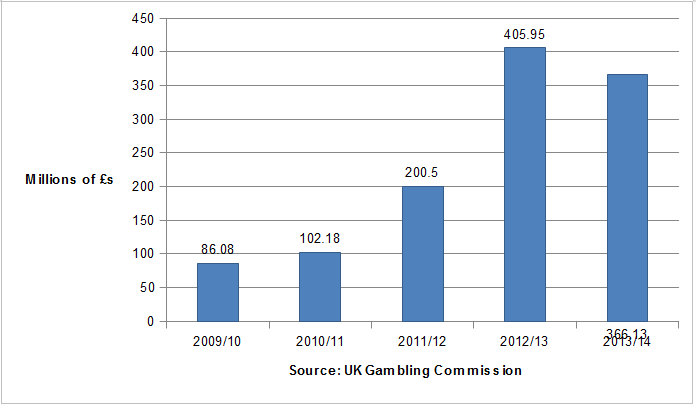 Ever since 2010/11, slots have been much closer to table games in generating revenue. Then, after surpassing table games in 2012/13, slots accounted for revenue of £366.12 million when table games could only manage £283.29. To understand the sensation of playing slot games, MIT professor Natasha Dow Schüll wrote a book focusing on slot psychology. In determining that some players effectively self-medicate with slots, Schüll defined the act as entering the machine zone. Surprisingly, though, she found that the feeling is remarkably similar to the positive state of production entered by artists and writers when their work flows easily. Schüll explained that slots are appealing for players because the smooth flow of the gaming experience feels good. For as long as gameplay lasts, players will feel positive, much as if they are escaping from the pressures of reality. This is similar to console video games that let players enjoy virtual experiences they are not going to experience in their own lives. When it comes to winning, Schüll explained that players want to receive at least a low rate of winnings every few spins in order to provide positive reinforcement. Without some regular successes, there is no reason for them to continue playing. However, in the case of in-game triggers, such as jackpots and bonuses, these can feel jarring at first, as players will be drawn out of their regular rhythm. Having too many intrusive elements can remove players from the coveted machine zone and harm the long-term appeal of the slot game. Slots of a low variance design are those that enable players to win small amounts on a regular basis. As a result, there is an extremely low level of risk and they can play for longer than slots carrying higher stakes. Even the maximum jackpots on offer in low variance slots are winnable, which is why these can be so popular at online casino sites. At the other end of the scale, there are high variance slots. These are typically blockbuster slots based on hugely popular TV shows and movies. For instance, the Marvel Mystery Progressive Jackpot is a prime example. Although supposedly awarded completely at random, the Marvel slots connected to the jackpot state that the odds of triggering it will improve by increasing the size of the stake. High variance slots are more expensive to play and the lower level wins are less frequent – it’s all about the headline jackpots. Between low and high variance, it is also possible to have medium variance where slots are balanced for their low and high-end payouts. Having a slots library with all three types of variance is important for casino sites, as players need to have choices present for their current mood, further highlighting the value of psychology. In a 2013 video interview with Cool Hunting, Brett Jackson, director of game development with Bally Technologies shared a number of psychological insights relating to the player experience of slot games. On a subconscious level, Jackson explained that the simple act of recognising and matching patterns is extremely pleasing to the human race, and that has been the case from the days of cavemen. Jackson also spoke of a unique charge that players feel when they see symbols drop into place along the reels of a slot game. He believes that no other type of game can quite replicate that feeling. Although some might be similar, such as Candy Crush, they just simply aren’t the same. Enticing players to try a slot game is a crucial first step in attaining popularity. To that end, Brett Jackson of Bally Technologies highlighted the visual power of eyes. His rationale was that players connect with eyes, and that they can draw them into the world of a game. By creating connections, slot developers can encourage players to keep coming back. For players who embrace their heritage, Jackson said that Bally Technologies develops slots steeped in culture and mythology to create a meaningful bond. While this is not the same for players living in the western world, bonds are created with them by developing slots that cater to their interests. Whether a player likes fantasy, adventure, sports, music, or animals, there are now slots covering all of those themes. Essentially, slot themes act as points of connection for players. The random nature of slot games was also highlighted in the interview. In contrast to video games, a slot is purely passed on random outcomes and is devoid of skill. By creating games that are not dependent on skill, this ensures that they are highly accessible. As a result, players can jump straight into a slot game without having to cope with a punishing learning curve. But while a lack of skill is part of the appeal of slot games, this is not quite enough for slots designed for the 21st century. Jackson explained that creating interaction through the inclusion of special features and bonus games adds excitement for players and gives them targets to aim for. Of course, developers like Bally have to find the right balance between core gameplay and special features or else they risk drawing players out of the pleasurable machine zone outlined by Schüll. When speaking to the 2013 Casual Connect conference in Hamburg, Al Thomas spoke of how he transitioned from designing video games into creating slots. After seeing the challenge in front of him, he decided that he wanted to integrate the graphical qualities of video games into slots to create a superior player experience. However, casino software development managers of the 1990s were resistant to change, but the new approach eventually proved to be a winner with players. Thomas now works with Bluehare Studios and is still championing innovative features such as immersive graphics and 3D bonus rounds. Another key point to draw from Thomas’ address at the conference was that slot developers had to understand a fundamental limitation of technology. For all of the illusion and wonder that can be created through visual and audio effects, players still appreciate the mechanical appearance of the reels on an old school slot machine because they feel that they can trust its functionality. Consequently, even online slot developers need to design their digital reels to appear mechanical. In explaining the psychology of the players, Thomas said that they “trust the psychics” of the slot, even if they don’t exactly understand how it works. Essentially, they have to believe that the outcome is truly random, and this confirms the trust-based assertions made by Brett Jackson of Bally Technologies. Above all else, Thomas had some fascinating insights to share in relation to the licensing of entertainment properties. For anyone who believes that licenses are merely a ploy, they could not be more wrong. Casino software developers obtain the licenses of players’ favourite TV shows and movies because of the familiarity they feel when they see their logos nestled among a largely unfamiliar selection of games. Upon signing up with a Playtech casino, for example, a Marvel fan can play video slots based on The Avengers, Iron Man, Captain America, and The Incredible Hulk. Just seeing those names alone will draw them into the slots. Had the player not seen any familiar names in the first place, they would have been less likely to engage. Furthermore, designing slot games based on player interests also serves the same purpose as entertainment licensing. Players can look at slots based on animals, sports, or horror and choose to play the relevant theme to them because of familiarity. Lastly, a common aspect of familiarity is that it encourages people to feel comfortable. After considering all of the findings and analysis gathered previously, much of which has been drawn from slot design professionals and psychology, there are clear elements present in many successful slot games. • Familiarity – Whether through official acquiring licenses of entertainment properties or wide coverage of player interests, successful slots need to feel familiar. To do that effectively, the name and appearance need to convey the theme or else players might overlook them. • Trust – Digital slot games cannot entirely move on from mechanical slots. Experienced slot designer Al Thomas has found that players need to trust that slots are random. Making reels appear mechanical in design lets players feel like they can understand how the game works. • Connection – Brett Jackson of Bally Technologies knows that players will want to experience slots they feel connected with. To create connections, Jackson recommends developing slot games with imagery that players can relate to. For example, eyes and lucky symbols can capture attention. • Escapism – Schüll’s psychological research of slot games determined that players enter a pleasant state, known as the ‘machine zone’, which is similar to what artists feel when they’re productive. Slots with too many invasive elements risk disrupting the sense of contentment felt during gameplay. • Variance – Players need to earn winnings at regular intervals in order to validate their experience. Positive reinforcement is more frequent for low variance slots than for high. Consequently, players are likely to stop playing if they go for long spells without winning anything. More paylines can increase the chances to win. Developers can then control payouts by assigning modest multipliers. • Features – Another crucial point made by Jackson was that slot games are not skill-based. And while this makes them highly accessible and simple to play, this can harm the long-term popularity of a slot if it does not have special features. Jackson explained that Bally Technologies add bonus games to give players a target and to inject the feeling of skill. • Mobile – The rise to prominence of Apple iOS and Android in 2012 in the UK mobile operating systems market propelled online slot games to generate record revenue of £405.95 million in 2012/13. Ensuring mobile functionality on smartphones and tablets will dramatically extend the reach of a popular slot game. A failure to do so will only limit the potential for developers. Based on the factors outlined above, it can be concluded that successful slots will give players a comfortable experience that injects excitement in the right places, much like popular media. A software developer that manages to succeed in addressing the seven elements highlighted in the conclusion could well have a hit slot game on their hands.